Inside Storey: Sue Weaver: Got (Moose) Milk? 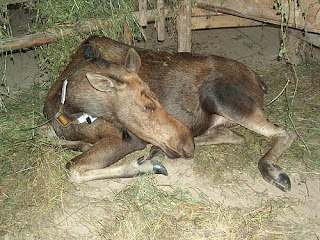 Sue Weaver: Got (Moose) Milk? For 6 of the years I lived in Minnesota, I worked at the Minnesota Historical Society’s North West Company Fur Post, interpreting the lives of mixed-blood women in the Great Lakes fur trade. As a result I knew many people engaged in outdoor North Country activities such as mushing. I think we live in the Ozarks now because John saw sled dogs in our future — but that is another story. The gist of this one is that I loved hearing musher friends talk of their adventures running such races as the John Beargrease Sled Dog Marathon and of longer, tougher races farther north. Most of these mushers told tales of mass mayhem involving moose. Moose, they’d say, are absolutely unpredictable (some said downright crazy). 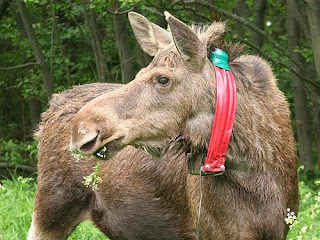 So imagine my surprise when, while researching material for my upcoming cattle book, I came across references to milking moose cows. 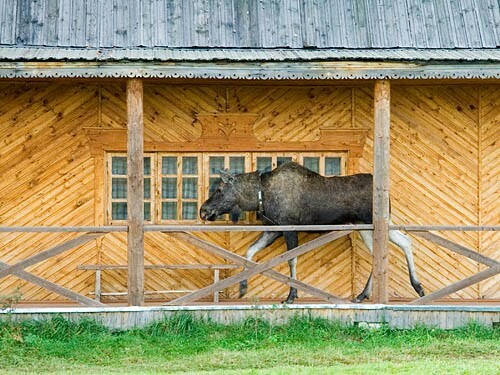 I knew personnel at Hudson’s Bay Company outposts occasionally raised a moose calf or two and later trained it to ride or pull a sled, but milk? That was a different wrinkle. I had to know more. Further research led me to a now-favorite Web site both whimsical and informative that I want to share with you. 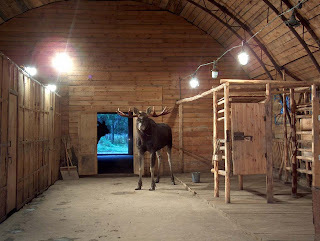 Created by Alexander Minaev, a senior scientific researcher working for the A. N. Severtzov Institute of Ecology and Evolution at Russian Academy of Sciences in Moscow, it details life at the Kostroma Moose Farm in Russia. 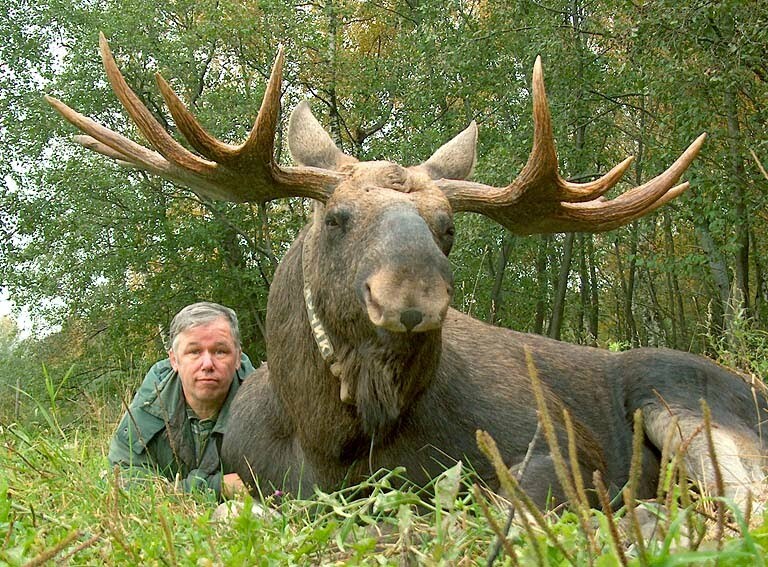 These pictures are compliments of Dr. Minaev (pictured in this image with a bull named Luchik). Is this amazing — or what? 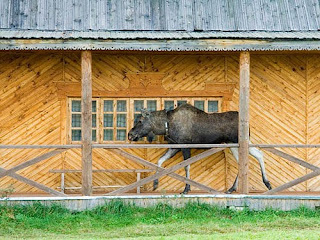 The Kostroma Moose Farm is a densely forested experimental farm in the Krasnoselsky district of Kostroma Oblast in west-central Russia, 15 miles east of the city of Kostroma. Established in 1963, it’s home to a moose husbandry laboratory maintained by the Kostroma Agricultural Research Institute and roughly 33 moose, some of which are kept for dairy purposes. 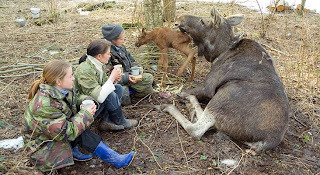 “Kept” is not, perhaps, the most appropriate word as, except immediately prior to calving, moose at the farm are free to come and go as they please. Moose dine on up to 300 plant species — keeping them healthy on furnished feed? It can’t be done. The farm does supplement their diets, with steamed oats (“oatmeal”) being the primary furnished fare. 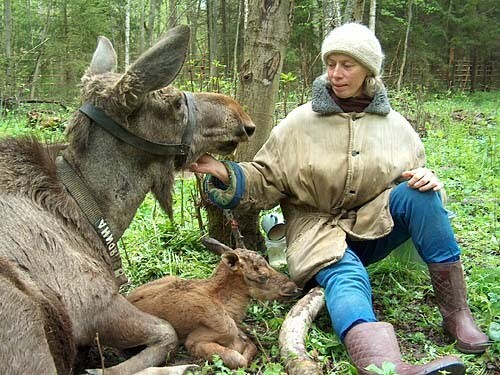 Moose at the farm are bottle-raised and imprinted on their human caretakers, so while they range afar, they come home for oatmeal and milking. Dairymaids milk between 10 and 15 cows at the farm each spring. my musher friends think they are. 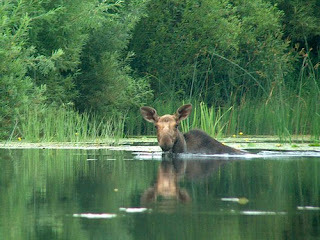 Dr. Minaev’s Web site is packed with wonderful pictures like these. Though English is his second language, the doctor is articulate and funny, and the information is so interesting. 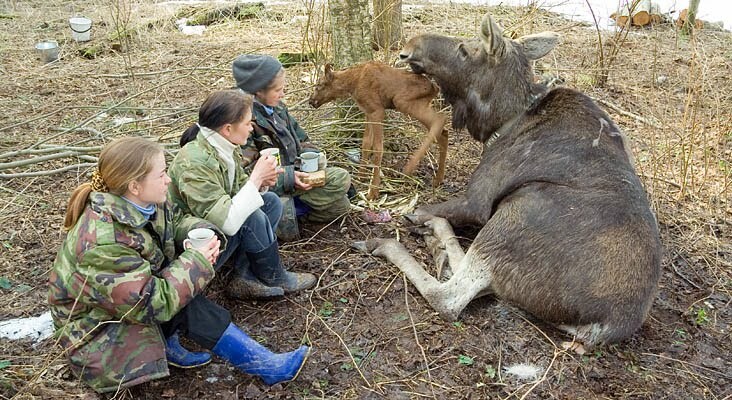 Moose milk: who’d have thought it? Check it out. I think you’ll be pleased when you do. Since dairy cows are so destructive to the atmosphere, any milk and meat alternatives are welcome ones, especially when they can boost the economy of often impoverished and sparsely populated areas. I hope this catches on! Also, kangaroo meat is beginning to look like a promising substitute for beef. Something like that will take time, as it involves a lot of specialized breeding, and as any aussie can tell you, they're pretty invasive.